Deciding what to charge can be a little stressful for some hosts; finding that “sweet spot” of “not too high, not too low” may seem like a challenge for even the most seasoned hosts. Don’t fret, though! We’ve got some suggestions for how to decide on whether or not charging the optional fees is right for you and how much you should require if you do. There are a few different fees that Airbnb and other vacation rental platforms always charge, like the flat 3% service charge, as well as a few that are up to you as the host. Contrary to how it may sound, a security deposit isn’t paid by your guests before they check in. Instead, this is an amount you can charge to help cover damage or cleanup (if your place is left excessively messy) costs. 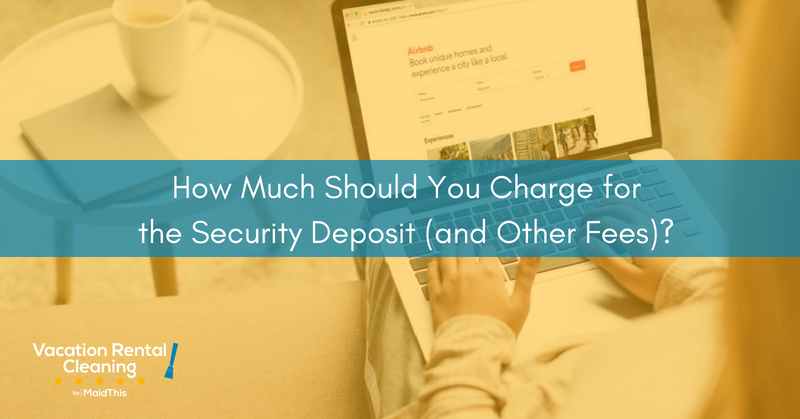 As a host, though the deposit is outlined for guests when they book, you can only invoke and request a security deposit after a troublesome guest has checked out. Deposits aren’t required by most vacation rental sites; this is entirely left up to you. Deposit amounts are calculated based on a percentage – from 10-50% of the rental agreement. If you’re not worried about the cost of replacing damaged things in your home, you can easily forego the deposit and not worry your guests. However, it would also be acceptable to request a low deposit just to be safe. On the other hand, if you have nice things in your place such as expensive furnishings, irreplaceable items, or art, you should consider requiring a heftier deposit, somewhere around the 50% mark. As guests aren’t required to pay this amount up front, it shouldn’t be a deterrent to your occupancy goals. Cleaning fees are a one-time fee that guests pay upon completing their reservation. These are set by you (the host), are optional, and are much easier to figure out. How many bedrooms does your place have? How many bathrooms? How long will your guests be staying? Do you plan to offer any additional, “light” maid service to them during a longer stay? How many loads of laundry will you need to do to ensure all the linens are ready for your next guests? Will other areas of your vacation rental need to be cleaned? How much time, overall, would it take you to clean the entire place yourself? Can you bake in amenities reimbursement into this (toilet paper, shampoo, etc)? Skip the headache and let MaidThis! handle your turnover cleanings. We’ll let you know what the cost will be, and you can incorporate that into your fee. It’s also wise to charge a tad extra here just in case you’re ever in a pinch and need to do some extra cleaning after a particularly messy guest. Hold on to that extra little revenue until you need it; those little fees will add up quickly and can help you better manage your seasonal cleaning, too. There’s no reason to fuss over setting fees. Guests understand that there will be some additional monetary requests made of them to stay anywhere, even a hotel; vacation rental sites are simply more open about showing them where their entire payment goes. So when it comes time to set or adjust your fees, do so without worry! Use the guidelines above and we’re sure you’ll find a solution that best fits your vacation rental and your guests.